People like to take their pets with them to restaurants, as a recent question to our own Salty Waitress about animals outside patios attests. But while furry friends are one things, cold-blooded ones are quite another. 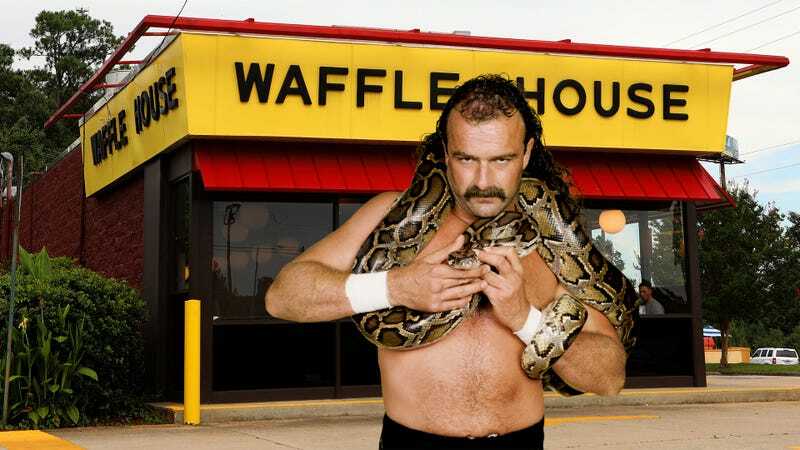 Nevertheless, a Waffle House patron in McComb, Mississippi decided to take his snake out to dinner, says the Associated Press via WABT in Jackson. According to a posted Facebook video, the guy was just hanging around Waffle House with a healthy-sized snake around his neck. An attempt by the Waffle House security guards to get the man to leave with the snake resulted in a confrontation, in which one of the guard pulled his gun out of his holster after a lot of yelling back and forth. At that point, the man with the snake took the snake from off of his neck and into his hands, yelling, “Let’s do it! Let’s do it!” Waffle House patrons wisely ran toward the exit. Although it looked like the snake guy was egging on a confrontation, even he has has to know that in a weapons matchup, a gun trumps a snake, right.